I need some help with the wiring of my new Lenco Tabs. Over the weekend I installed the blades and actuators with lots of 5200. I did not have enough time to hook all the wiring up and was not sure of the best way to tie into the electrical system. I believe I find a circuit to hook the red and black wires to on the hub under the helm. I assume there will be one available? What if there is not a spare? I am not sure how to handle the orange wire to indicate when the engine is on or off? There could be a TT dedicated breaker under your helm marked TABS. If not, use one of the spare ACC breakers but make sure one you use is 20A (as per diagram above). If not replace one with a properly rated breaker. 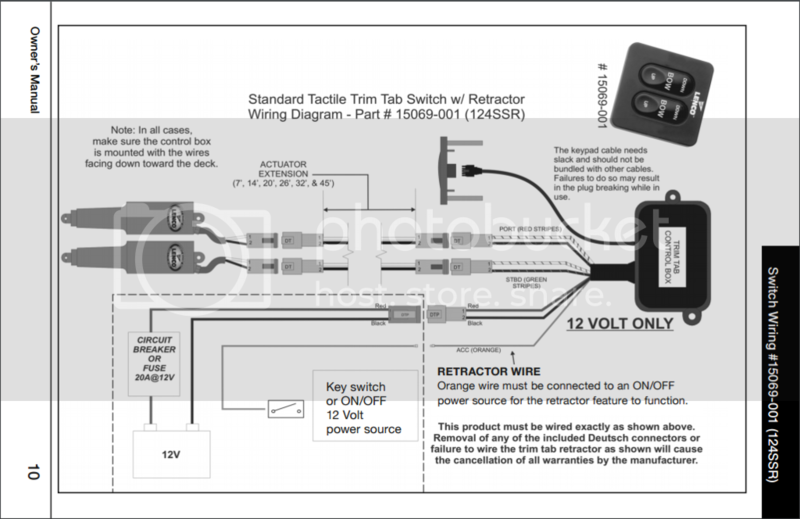 The retractor wire can be connected to engine ignition switch, or to TT switch if you have one or to one of ACC switches. I like to use independent dedicated switch (as opposed to ignition switch) as it allowes you to retract/reset the tabs at any time. On mine I didn't have an extra fuse spot, so just added a waterproof in line fuse fron AutoZone. I had to tap a wire, When I called my Mech. He said find the Purple wire under the dash, tap that one for the retractor.